Photo provided Tubing at Mad River is a popular winter-time event in this area of Ohio. Provided photo Snow Trails near Mansfield offers many things, including skiing classes. Provided photo At state forests, cross-country skiing is permitted on hiking and bridle trails as well as access roads when conditions permit. Many state parks also allow cross-country skiing where there are expanses of open areas such as picnic areas, shoreline areas and golf courses. Cross-country skiing is allowed only when the ground is frozen and completely covered with snow or ice. Trails are not groomed. Skiers must provide their own equipment. Rentals are available at some state park locations. Take advantage of all the natural beauty and romance Ohio’s winter season offers by packing your bags for a getaway with your special someone or a family outing. Whether your preferences include woodsy hikes, snuggling by the fire or a rollicking toboggan run, start your travel planning at Ohio.org. Become one with nature at Beech Creek Gardens’ annual Bird in Hand in Alliance. Explore the outdoors and hand-feed wild chickadees. Your little ones will love the “Play-viary” filled with a variety of both fun and educational activities, and all can enjoy an outdoor fire, hot cocoa and roasting marshmallows. Bundle up and enjoy discounted family fun at Snow Trails in Mansfield. Catch a ride on the ski lift, try your hand at skiing, or snow tube with the entire family. Save on everything from group lessons to rentals at this all-day event. Both you and your little ones will enjoy Bowling Green’s annual WinterFest. Featuring everything from an ice garden and carving demos to a Winter Market, live entertainment, snacks and carriage rides. Get ready for a great two days of festivities. A time-honored tradition, Ohio does sledding like nowhere else. With snowy weather on the horizon, now is the perfect time to grab your sled, a toboggan, a tube, and your family. This will be a winter to remember. A favorite tubing spot and Ohio’s oldest ski resort, Snow Trails serves the Mansfield area with 1,100 long tubing lanes and a cozy lodge to grab a bite to eat. The best part? You don’t have to carry your tubes back up the hill. Conveyer belts make it easy for even your little ones to go up and down the hills with ease. Visit www.snowtrails.com for more information. About 600 tubes ensure that no matter the crowd, you and your family can find a tubing seat. These grades are perfect for all ages and don’t have height requirements. Join a group of friends at the park’s premier concert and event venue, The Loft Bar and enjoy occasional national music acts and a huge beer selection. Find sledding all over the state, like known favorite Punderson State Park, which provides a slight grade lighted sledding hill along with a winter sports chalet. Check out their website for a complete list of all parks that have a designated sledding hill — just make sure to bring your own equipment. Visit http://ohiodnr.gov for the best sledding locations by park. Usually a summer attraction, the Beach Waterpark doubles a tubing location in the winter. Just north of Cincinnati, this park is beloved by local families and can accommodate small children. Visit cincinnatiusa.com for more information. With or without snow, the Chalet runs through March and offers a perfect experience for thrill-seekers. The twin, 700-foot refrigerated ice chutes can accommodate a small group or a single person, so challenge your friends to take the plunge. With excellent access and plenty of parking, the designated sledding area offers trails that range from bumpy to perfectly smooth. About 700-800 feet, this 40-degree hill is also situated in perfect proximity to the Dayton Aviation Heritage National Park. You can also visit cultural and historical centers that detail Wilbur and Orville Wright’s journey through aviation. 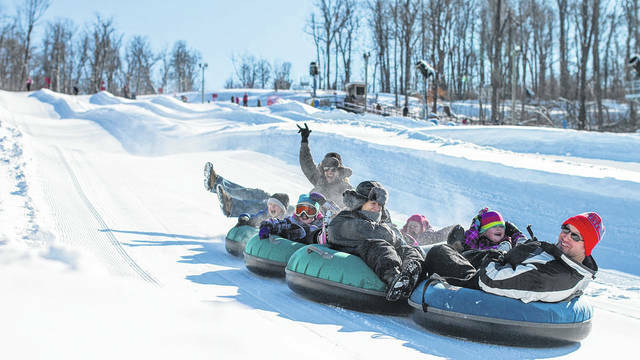 https://www.dailycall.com/wp-content/uploads/sites/30/2019/02/web1_Tubinat-at-Mad-river.jpgPhoto provided Tubing at Mad River is a popular winter-time event in this area of Ohio. 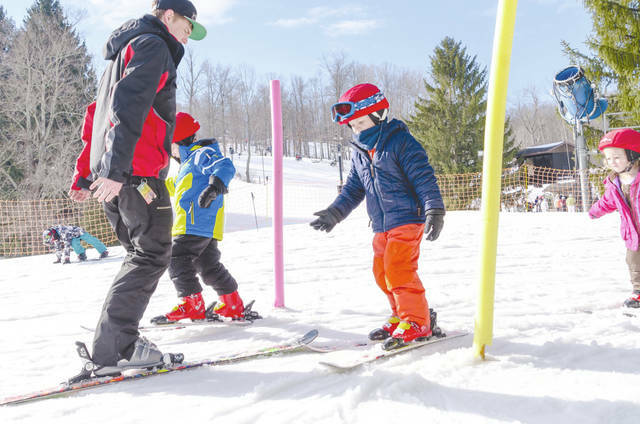 https://www.dailycall.com/wp-content/uploads/sites/30/2019/02/web1_childrens-program-snow-trails-10-2.jpgProvided photo Snow Trails near Mansfield offers many things, including skiing classes. https://www.dailycall.com/wp-content/uploads/sites/30/2019/02/web1_banner-ski2.jpgProvided photo At state forests, cross-country skiing is permitted on hiking and bridle trails as well as access roads when conditions permit. Many state parks also allow cross-country skiing where there are expanses of open areas such as picnic areas, shoreline areas and golf courses. Cross-country skiing is allowed only when the ground is frozen and completely covered with snow or ice. Trails are not groomed. Skiers must provide their own equipment. Rentals are available at some state park locations.